He was promoted from Zuo Shu Zhang(左庶長, vice prime minister of Qin) to Da Liang Zao(大良造, prime minister of Qin) by King Zhaoxiang of Qin. He had commanded wars against the states of Han, Wei, Zhao and Chu, seizing large areas of territory. In 278 BC, he led the Qin army to capture Ying, the capital city of Chu. As a reward, he was given the title Lord Wu'an (武安君, literally: lord of martial peace). 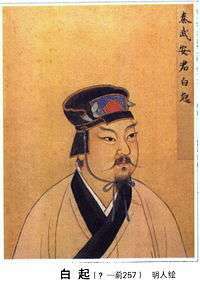 During the Battle of Changping in 260 BC, he succeeded Wang He as the commander of Qin army, and soon defeated the Zhao army commanded by Zhao Kuo. The Zhao army was split into two parts and its supply lines and retreat route cut off by Bai Qi. More than 400,000 Zhao soldiers, including the Shangdang people who surrendered after Zhao Kuo was shot dead by Qin archers, were slain（坑殺buried alive) on the orders of Bai Qi. Bai Qi wanted to end Zhao once and for all, as the Zhao troops were psychologically affected by the Battle of Changping. But the prime minister of Qin, Fan Sui, who was persuaded by a talker from Zhao, feared Bai Qi's rising power, and recommended the king to stop the attack on pretext that the Qin troops ought to be rested and to accept a ceded territory negotiation. Bai Qi hence stopped the attack and on his return journey to the State of Qin, he fell ill. In 257 BC, Qin started to besiege Handan, capital of Zhao. Because Bai Qi was ill the Qin king had used another prominent general, Wang Ling (王陵) who subsequently lost the battle. After about four months, when Bai Qi seemed to have recovered, the king asked Bai Qi to return to his post as commander. But Bai Qi held a different opinion, he argued that Qin had no longer enough resources on such long-range war, and the other states would soon attack Qin since Qin had been contrary to the negotiation. However, the king insisted on continuing the attack. Bai Qi refused the command of the king with an excuse of his illness. The king, therefore, had to use Wang He (王齕), another prominent general of Qin, instead of Bai Qi, as the commander. This decision did not help the Qin army in the battle at all. Chu and Wei soon sent troops to assist Zhao. After more than five months of continuous defeat at Handan, Qin had suffered major losses. The king asked Bai Qi to become commander again. Bai Qi once more used that he was sick to refuse the request. In Zhan Guo Ce, his true intentions was revealed when he states that he would rather be executed by refusing the King's order, rather than losing his long undefeated fame on the battlefield. Having been refused several times, the King become angry, removed all titles from Bai Qi and forced him to leave Xianyang, the capital of Qin. In addition, Fan Sui, persuaded the King of Qin that Bai Qi would join another state as a general and become a threat to the State of Qin. Convinced by Fan Sui's information, the King of Qin then forced Bai Qi to commit suicide in Duyou (杜邮). Bai Qi is noted in Chinese history as a symbol of brutality rather than for his military talent. The traditional Tofu dish of Gaoping, today's Changping, called Bai Qi meat is well known. Some stories have been written about Bai Qi suffering for his brutal actions, such as one mentioned in Chronicles of the Eastern Zhou Kingdoms, which says that an ox with two Chinese characters, 'Bai Qi', tattooed on its back was executed by lightning in Tang Dynasty. Bai Qi is one of the 32 historical figures who appear as special characters in the video game Romance of the Three Kingdoms XI by Koei. He has the highest military leadership statistics of all the characters. Bai Qi, also known by the Japanese reading of his name, "Haku Ki", is the leader of the Six Generals of Qin in the manga series Kingdom. Bai Qi appears in Gate of Revelation, a Chinese modern fantasy novel. 293 BCE Battle of Yique. Killed 240,000 State of Wei and State of Han troops. 272 BCE Besieged a Wei Fortress and killed 130,000 Wei soldiers. He then killed a further 20,000 Zhao soldiers and threw them into a river. 263 BCE Sieged 5 Han fortresses and killed 50,000 Han soldiers. 260 BCE Battle of Changping. Defeated State of Zhao in battle and killed all surrendered Zhao soldiers except for 240 men in order to inform Zhao. Total Zhao losses about 450,000 men.